Think I need to lighten the mood on these pages, so let me tell you it was over 4 months ago since we had a day at the Grand Canyon but honestly if it been 40 years ago my memories of that day wouldn't have diminished any. This was the same trip that we visited Palm Springs, the Joshua Tree National Park, Las Vegas and the red rocks of Sedona and also *sits up proud* the day I flew an airplane. That was later in the day back to Sedona though, flying into the Grand Canyon's West Airport terminal early morning I only had one thing on my mind, and that was to take as many photographs as possible of one of the most amazing natural icons on the planet. The Grand Canyon is an overwhelming experience and superlatives often fail to do the landscape justice. I will write this and hopefully you will read it but please promise me that you will actually go there yourself. For those who don't know, the Grand Canyon is a massive canyon carved over several million years, six by most estimates, by the 1,450 mile long Colorado River as it cut through layer after layer after layer of rock as the gigantic Colorado Plateau was lifted up. It is not the world's deepest canyon, that title belongs to Cotahuasi Canyon in Arequipa, Peru but the Grand Canyon is far more famous due to its overwhelming size and its intricate and colorful landscape. Geologically it is significant because of the thick sequence of ancient rocks that are beautifully preserved and exposed in the walls of the canyon. 5 million visitors come ever year to stare at the jagged elevations and blindingly beautiful layers of rock. 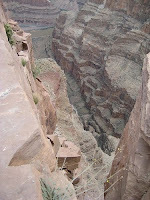 The canyon's elevations range from as high as 9,000 feet to the banks of Lake Mead at just over 2,000 feet. Our guide took us to the West Rim. 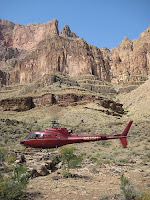 After landing we immediately got into a helicopter and flew a mile deep into the canyon itself. Soaring vertically down, it was an incredible experience. At the river's edge we jumped onto a pontoon boat and caught our breaths. We spent about 20 minutes floating down the Colorado River in between gold and red cliffs. 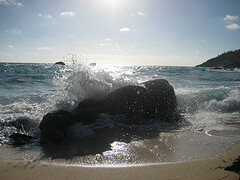 The silence was as golden as some of the rocks. 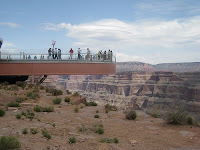 Also at the West Rim is the fairly new (opened in March, 2007) Sky Walk (right) and at 4,000 feet above sea level it wildly claims to be higher than any skyscraper in the world. You know I love skysrapers so I couldn't resist paying the $30 to walk on it. No cameras are allowed but official photograhers are happy to take photos, of course they are, which by coincidence you can buy in the shop. 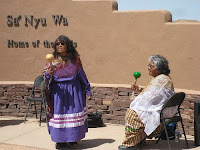 The Sky Walk was commissioned and is owned by the Hualapai Indian tribe and it caused much consternation at the time, but an indian's got eat, right? And blimey looking at the ones trying to sell their cliché-ridden Wild West crap to tourists, they sure do like the odd burger. It is a fact that one quarter of people that live on most Indian reservations suffer from diabetes, brought on by obesity. The Sky Walk was just about worth it. 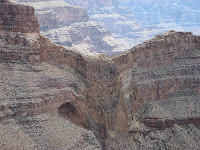 Horseshoe shaped it protrudes 65 ft beyond the edge of the canyon facing what is called Eagle Point (left). Hurricane and earthquake proof the walls and floor are built from 4 inch thick glass and no more than 120 people are allowed on the semi-circular walk at anyone time. I have to say that quite a few scratches were already visible on the glass floor when we were there, so make sure you have lunch after as we did in the Sky Walk Cafe, hideously touristy but the grub wasn't bad. 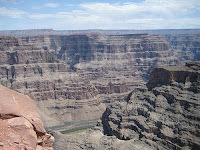 Unlike the South and North Rim, Grand Canyon West is not part of the Grand Canyon National Park. 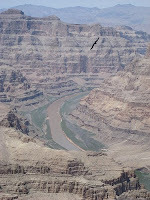 We literally flew in and flew out of the Grand Canyon but many thousands camp each night at the North and South Rim. Before you attempt any of these though seek advise as in a lot of areas hiking is discouraged and permits are needed for camping. Whilst the West Rim is o nly accessible by a 12 mile dirt track, the South Rim is much easier to get to and has the most amenities, including hotels and lodges. Watch for heavy traffic in the summer months and the freak weather that I endured the last time I was there in the 1990's. The North Rim does not have the transport options that the South does, but a seasonal shuttle does run between the two. For the adventurous whitewater rafting, mule riding, elk and mountain lion spotting, cycling, hiking and running are especially popular and there are many overlooks accessible by car for those even more lazy than me. There is a less known East Rim too, this has a lower elevation and a scenic drive. Visitors there can actually look into the canyon up close as opposed down from high. Plan your trip though, whether it is a plane or helicopter day trip or a longer stay, this place is so vast but so unforgiving.